A recent G20 summit communiqué out of Hamburg Germany acknowledged the abdication of Trump but emphasized the global commitment to responsible climate action. 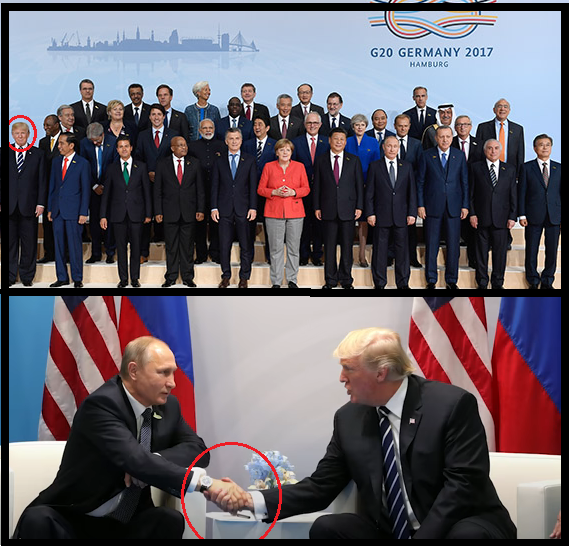 Historically the G20 has made unanimous declarations but Trump's decision to quit the Paris Climate Agreement resulted in a break with this tradition. Despite the isolation of the US, the world's leading economic powers indicated that they remain serious about climate action. The summit was marked by riots and Trump was singled out as the preferred target of the protestors. Trump was characteristically awkward at the summit and he appeared to have difficulty following the discussion at times. At one point Trump had to be diverted from his day-dreaming to turn around and pose for the cameras. Trump's only contribution was an initiative to help other countries burn fossil fuels more cleanly. This is rather ironic as the Paris Agreement seeks to end the burning of hydrocarbons. Trump's decision to quit the Paris Climate Agreement met with widespread resistance. The entire world (except Syria) has embraced the need for climate action and this includes most Americans. Although Trump claims to be a champion of economic growth his decision is being resisted by corporate America and other levels of government. Led by California, US states and cities have vowed to counteract the Trump administration's inaction. While Trump's climate denial is unpopular at home it is openly reviled abroad. Canadian Prime Minister Justin Trudeau tried to educate Trump on the relationship between climate action and economic growth. Trudeau also pointed to the efforts of Canada's provinces, municipalities, and businesses in the absence of federal leadership on climate change during the Conservative rule of Stephen Harper. "The fact that the G20 stayed strong and committed, even with the United States stepping aside, is a strong indication that the global community in general is committed and united," Trudeau told reporters. "I think that we can look at the global community holding together so strongly on the topic of climate change is a credit to the G20." Both German Chancellor Angela Merkel and the UK's Conservative Prime Minister Theresa May said they were "dismayed" by Trump's decision to withdraw from the climate deal. "Like other world leaders here, I am dismayed at the U.S. decision to pull out of the Paris agreement and I have urged President Trump to rejoin the Paris agreement," May said. Merkel said she regretted the fact that the US had abandoned the climate consensus. However, she added that she is, "grateful that every other head of state and government acknowledges that the Paris Agreement is irreversible." Although there is a broad consensus to act on climate change Trump's withdrawal has caused Turkey to consider reevaluating its participation. Despite attempts by advocates, social issues failed to gain traction at the summit. This is unfortunate because there is an intimate relationship between social inequality and the election of populist leaders like Trump. Social issues must be taken into account if we are to safeguard our democracies against future political travesties. Despite the efforts of Oxfam's Jörn Kalinski, social inequality was all but ignored. "[I]nequality is destroying social cohesion. People who feel left behind get frustrated and run into the arms of right-wing populists. And that is a threat to democracy," Kalinski told DW. The meeting between Trump and Russian President Vladimir Putin went as planned. The two despots denied Russian interference in the 2016 presidential election and agreed to work together. Although it did not make the headlines, cooperation between these pleonectic leaders could augur an environmental and climate disaster. The end game may be the lifting of sanctions. Putin needs Exxon's cooperation to extract oil from beneath the ocean floor of the Russian Arctic. There is a half a trillion dollars of fossil fuels up for grabs and the climate consequences are catastrophic. If it goes through the "deal" would unleash a massive carbon bomb at a time when we desperately need to reduce emissions by moving away from fossil fuels. Trump's decision to quit Paris is counterproductive and may not serve his political agenda. Although he may have support from the minority of Americans that make up his base, his policies, particularly those related to climate action are at odds with the global consensus and reality itself. "Trump has lost another collision between fantasy and reality. No other global leader shares his fantasy that climate change is a hoax," said Tom Burke, chairman of E3G, a London-based think tank on energy and environmental issues. "Other governments, cities, businesses, entrepreneurs, and communities, including many in his own country, will carry on with the serious business of tackling the greatest strategic threat to our prosperity." No one did a better job of reviewing Trump's failure at the G20 summit than the award-winning political editor Chris Uhlmann. As reported in the Guardian, Uhlmann said Trump is a man with, "no desire and no capacity to lead the world". 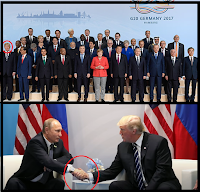 The centrist Australian reporter described Trump as "isolated and friendless" at the G20. "He was an uneasy, lonely, awkward figure at this gathering and you got the strong sense that some of the leaders are trying to find the best way to work around him," Uhlmann said. He went on to say that Trump isolated the US, confused and alienated its allies and ultimately diminished America. Uhlmann concluded that Trump's policies are contributing to the "decline of the United States". He also described the American demagogue as "the biggest threat to the values of the west". Uhlmann said Trump was obsessed with "burnishing his celebrity" and had "diminished" his own nation to the benefit of Russia and China. In his final assessment of Trump's malfeasance Uhlmann said he is, "a man who barks out bile in 140 characters, who wastes his precious days as president at war with the west’s institutions like the judiciary, independent government agencies and the free press." After only five months of Trump's rule, his presidency is proving to be an unmitigated disaster. Trump is more than a disgrace, he is a clear and present danger both domestically and abroad. The sooner his presidency comes to an end the safer the world will be.